This week Cammy is joined by Alan Dymock from Rugby World Magazine to review one of the most bizarre international games in the history of rugby union. With a number of records smashed in the course of an unbelieveable 80 minutes the guys try to make some sense of what happened. 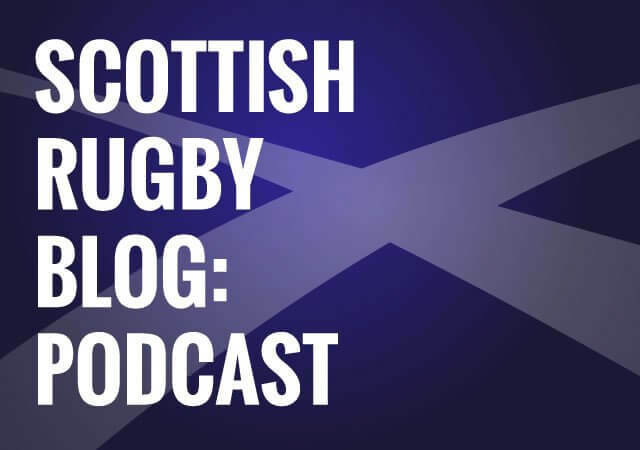 Later in the podcast Cammy is joined by John Anderson to talk about what might have happened in the Scotland dressing room at half time, whether England were lucky to keep 15 players on the pitch and why accusations of “plastic fans” are wide of the mark. John Anderson returns to the blog, Yahoo , At half time I couldnt help wondering if John’s telly survived to the second half of the game ! Was it target practice or spear tackled in the first 30 minutes. Me , I was doing my version of the Haka in front of the set, if telly’s could talk !! Here goes , hit the button , it is chuckle time. The question asked about what have we gained to take to the World Cup. Well, I know how England prepare for big games (dont ask, just accept it as fact) , they continually play positive experiences and their best wins to the team. * who scored the highest number of tries against an England side at Twickenham . * These men will be in the European Cup finals 2019 etc. It is this team who can play anyone and shine, we brought on Gordon (The Mighty Ducks) Reid who plays in the English Championship (not Premiership) and the scrum held. That was a ‘Mighty’ big statement of belief . One last point, I do believe Townsend had his 360 minutes of tactics and plays, and it was the players who had the last 40 minutes of guts and self respect. We need strong on field leadership to call it when it is slipping, McInally would now be my choice as captain. Am I the only one who really likes Gordy Reid? He gives his all, holds up the scrum, is always looking for a sneaky charge through the ruck or just looking to cause a bit of disruption. And he scored a try in The Massacre at HQ two years ago. I like him , just said so , he is much better than he gets credit for in these parts and when we had the audacity to play a guy who plays in the Championship , we gave 2 fingers to England’s Premiership stars. Yet another amazing weird fact no one has mentioned, till now. The thing to take on with London Irish is they are clearly building for promotion and next year. They have signed some interesting players and Dell could be Reid’s direct competition next season if he stays. Gordy Reid is vastly underrated. He is such a solid guy in scrum. His try at HQ was immense all heart. He used to be the only guy who could hold us steady now we’ve got Dell who has come of age and others out the picture right now but will be fine in a few years. With Fagerson, Berghan and Nel on the other side and three fine hookers it’s all good up front. What a difference it is making with our scrum steady. It’s rarely going forwards but I have only seen it going back once all season against France late on. No. I think he’s a great scrummager. Other people say he doesn’t do enough in the loose, but I’ve seen him put in some mighty hits and tackles. Maybe getting on a bit in international terms, but a sound player. Dell – rampaged down the pitch at Cardiff, and galvanised the team at that point. Scored a try against Fiji. McInally – THAT try against England. Fooled the Springboks in the lineout. Nel – he’s WP Nel. Berghan – stripped Ellis Genge. Watson – fooled the Springboks in the lineout with a try. Scored in Australia. Stripped Jerome Kaino of the ball. Bradbury – galloped over at Twickenham. Price – that chip & chase at Twickenham. BBC Highlights of six of the best tries of the tournament. 5 of the 6 involved Scotland. 4 against us 1 for us. Says it all really!!!! That did seem a bit bitter. All those teams scored better tries against other teams. Never thought in that was just thinking that we were involved in many tries both good (when we scored and the opp) and bad (we were during those tries at times against us) and summed up how good and bad we were. There were many other tries that were better but however poor we were the France one was nearly as good as Hogg’s reverse at home few years back against Italy. I think we could have created a top ten for and against us tbh. We were sublime and ridiculous in equal measure. Did we have a truck up five metre one at anytime? The Stat of being in the England 22 for seconds scoring x number at that point was crazy. What a day! Only just started this week’s podcast, but it’s worth remembering that the game was a draw, not a win as was stated! No matter…loved the Guscott one liner. Perfect! It amused me because it summed up how ambivalent people felt about the game – from 31-0 down, a draw should feel like a win, but getting head then conceding at the death makes it feel like a loss. Rugby’s ace. Incredible. Wow. Unofficial man of the tournament no doubt now. Playing with a fractured cheek bone is typical Russell. Yes and sounds like he spent most of the half time break on the physio bench getting attention for a let injury. One hell of a player. Lets hope he keeps getting better and stays fit for a few more years. Same for Hoggy. Another interesting detail from the ripples of the world league proposal. SANZAAR are cutting Sunwolves from super rugby and reverting to a 14 team round robin format. Previous opposition was due to financial hit Australian franchises in particular would face from reduction in home games. Rugby Australia has been reassuring the franchises that they will be compensated by additional broadcast revenues Australia will receive from the World League deal. So an immediate impact of the world league is to enable the cutting of the Sunwolves, at the behest if SA teams and the consolidation of SuperRugby. Anyone who really thought this wheeze was about growing the game and not financially supporting the SH Big 3 should really pay attention to this. Slow hand claps all round. I personally thought adding sunwolves was a mistake from the very start. Japan are just to geographically isolated to realistically compete at club level with the other rugby nations. We could have a super rugby with either a) AUS, NZ, JAP or b) AUS, NZ, SA & ARG. Japanese clubs should never be playing the same tournament as clubs from SA and ARG. It requires a cluttered conference system and even then there is way too much travel involved. (20+ hour flights over multiple time zones in different seasons) which ruins the SR product. Japan is able to fare on its own and would probably fare better when they don’t have to put out a SR team. I think this will suit all parties in the long run. It’s a bit like being asked to chip in for a flash birthday gift for a rich cousin…meanwhile, you’re lucky to get a card. How I feel with World League – ok we’ll ruin the 6N and put at risk our own participation, so that SANZAAR can trim back super rugby and afford to keep their best players at home, all so they can stay top of the pile. I’m sorry, did Australia send us money to help keep the borders afloat when they were coining it in from super Rugby going to pay tv and we were on the verge of bankruptcy? They did not. If the 6N continues as part of the world league, how is it ruined FF? Beautiful. Still gutted we couldn’t finish it. •	Injuries make it hard to assess where we are – not just in terms of the loss of quality (what teams can replace the quality of Hogg or Russell or Watson? ), but in terms of getting the units to gel. As it’s the norm, a handful of injuries wouldn’t necessarily affect performances, so one can still learn about the team as a whole, but having 20+ players out and so much disruption during games makes it hard to read too much into it. •	The dodgy decisions didn’t balance out – while we definitely got lucky with some decisions, Ireland, Wales etc. still ‘managed’ the officials better and got more joy out of the TMO (in the Ireland game the TMO was used to determine if there was a knock on in open play! Could’ve used that in 2015…). We’re still pretty bad at manipulating the ref, and really could do with someone like Warbs teaching our captains how to do this more effectively. •	We do better with younger, non-French refs, perhaps because they’re don’t have the same prejudices left over from the dark days. •	Despite the injuries and unfortunate officiating, we still could’ve won the games we lost! Against Ireland, France and Wales we lost because we lacked composure – we’d beat the defenders, make ground and then fanny around in the red zone without threatening to score. Was this to do with conditioning? Pressure? Injuries and disruption? Tactics? Individual failings? •	Despite our low number of tries, we had a very effective attack – we top the chart for defenders beaten and metres made, and we’re second for clean breaks, plus we conceded the fewest turnovers(!). Our issue was our attacking efficiency: we had to beat more defenders and run more metres for each try we scored than England, Ireland and Wales. The France game was a great example of this – we left four tries out there! •	We were also better at scoring medium/long-range tries than tries from within the red zone. Using the England game as an example: two tries were from turnover ball around halfway, one was from fast play around 5m out, and the other three were from fast play between halfway and the 22. I’d wager that most of our tries were scored from between halfway and the opponents’ 22s. It’ll be interesting to see if/how Toonie changes our attacking strategy in response to this – will he get Wilson to harden the forwards to make our pick ‘n’ goes more effective? Will we focus more on med-/long-range strike moves? Will our opponents start defending with more intensity in the Scottish Danger Zone? •	Our defence is really hampering us: not only do we miss more tackles than the other teams (only Italy had a worse completion rate), but our missed tackles are more damaging than Wales’ and England’s (we conceded a try for every 8 tackles missed, whereas England conceded a try for every 10 missed tackles and Wales only conceded a try for every 14 missed tackles!). Again, this could be exacerbated by injuries, but a try scored : conceded ratio of 0.82 isn’t good. Ireland managed to keep it even, Wales managed 1.43 and England managed an impressive 1.85, with most of that damage done by us. •	Bradbury, Ritchie, Johnson and Wee Graham are looking great (and I’d like to see more of Big Graham, too), but Kinghorn’s not ready for fullback, although he’s a very good international winger. •	We’re very negative about our players – none of them are as bad as Alex Cuthbert FFS, but you’d think that our players were worse if you read a lot of the comments about them. Grigg and Laidlaw both had very good games against England, yet they were being ravaged by some fans afterwards. Ultimately, although we finished 5th, we were a few moments of composure away from mixing it up in the top half of the table, and we’ve shown that we can perform in big games before. If Toonie can get us to do so consistently, we can be a real threat, and our depth is increasing all the time (can’t wait for Kevin’s next depth chart!). ‘Mon Toonie! -The remaining tries were intercepts of some variety. So, this 6N we were most dangerous from midfield. Weird. If we can get our first/second choice units playing together regularly, we’ll be SOOOO difficult to beat. If Townsend has the chance to play the same 23 for the four warm-up games (as I believe he should) we’ll be nicely settled, defensively and offensively, to beat Ireland in that first game. On the other hand, he may well use it as a chance to try say Richie Gray and Skinner in the second row, or Blade Thomson should he be fit to play, or try Taylor/Dunbar/Scott/Bennett alongside Johnson in midfield or Darcy Graham alongside Hogg and AN other. As you say combinations are key but there are some potentially great combos he hasn’t had the chance to try yet…! Merlot never going to happen yet doing that is a great chance to end up exactly like we’ve been this championship without key players out injured. Not a good idea although I see why u say it. Defence was indeed atrocious, and our lack of cutting edge in the “red zone” was apparent too. However, I truly believe this was due to injuries – and therefore different defensive units, as you suggest, TeamCam. IMO, the units that have to work together closely to have an effective defence are backrow, centre partnership and back 3. I’ve deliberately ignored tactical substitutions as they should have been smooth, planned for and practiced. First up – Italy. First game so the defensive units aren’t going to “click” as much anyway. We lost Sam Skinner after 13 minutes so had to readjust with Strauss on at 8 and shift Wilson to 6. Next Ireland. I can’t bring myself to go over the POM/Hogg non-tackle again, but suffice to say they wouldn’t have score if it were not for that. What we forget is we also had to re-arrange our backrow when Wilson went off at halftime (Harley replaced him). France was a shambles but we should not dismiss the effect of losing Johnson early in the second half and having to shuffle the midfield. Against Wles, we had our third centre partnership of the tournament (Horne-Grigg). Then we lost not one, not two, but all three of our back-3!!! Not sure how our defensive systems were supposed to cope but they did. In the end it was our attack that faltered. Against England – not sure what went wrong, but bear in mind Johnson was the only threequarter that played against Italy. Interesting analysis of our defence. Even with all the changes and disruption though you’d like to come think a well drilled and coached defence would stay strong. Look at Wales in the last World Cup when they held out with 13 men. For the Wales game perhaps our defence holding strong is as much to do about their attack than our defence as they had lowest number of tries alongside Italy. Does anyone know what time in the match that Tuilagi nearly decapitated Johnson (or so I’m told) I don’t remember seeing it. A shout out to Maitland actually, didn’t score but he was involved in 3 of the tries and kicked well. He would be my choice at 15 in the absence of Hogg and starts on the wing otherwise. Johnson’s near decapication is about 27:50 minutes in – Scotland had a line out in England’s 22 following a penalty. Throw over the top & Johnson picks up but lucky to still be conscious – he slips which probably saved Tuilagi from a card. No cos we didn’t get a pen so it wasn’t seen at time. England broke up.park so there was no advantage to us. Wasn’t seen in replay or deemed nothing to need to check. Any view on Scotland’s 6N fixture lists? Both seasons were frontloading our hardest games! At least Ireland usually start slowly, and we have a good chance at home to England, so maybe 2020 is a decent shot at the championship? I dont think it hugely matters anymore, we had Italy first up & the supposed momentum that would build was not evident. I doubt Ireland/England are particularly looking forward to having us first up with there new coaches anyway, Townsend (if he is still in the role) will be looking to exploit new defensive systems. I guess you’re right. If pencilled in my diary a Scotland championship contest for 2019 which didn’t materialise. Ireland’s new coach is Andy Farrell though so offers some consistency. Jones might still be lingering around, all dependent on RWC. I can’t remember ever playing England at Twickenham as an opener. Ending that hoodoo would be a nice way to kick off a grand slam season. Townsend will be there and will be the longest serving coach of the coaches out with Italy which has to be useful. Wales will struggle for a while after Gatland leaves as a few players will retire as always after world cup. We’ll be in the same place at start of 2020 as always “This will be out year” Only difference is we have to actually prove it for once. For 2020 Italy in the middle is handy, a chance to rest a few walking wounded, and the other games happen in 2 H/A pods. 2021 looks a bit brutal.